Style: Other "Mobile Single Wide"
Garage: Single, Detached "16 x 20"
Basement: Yes, Partial "Fully Finished"
Highway frontage to this 102 acre property located within the limits of the Town of Wilkie. 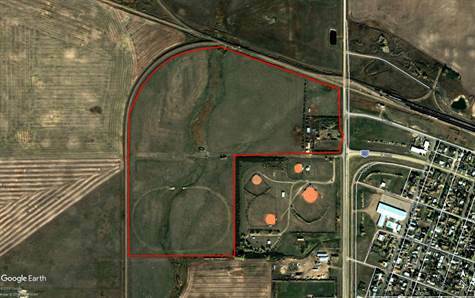 With 102 acres, this property offers the conveniences of living in town with the flexibility of an acreage. - Original 1985 mobile home with 1992 addition provides 1,472 sqft of main floor living space plus a 768 sqft finished basement. - Main floor features an open concept living room and dining room, master bedroom with 4 piece ensuite, 4 piece main bathroom, and 2 additional bedrooms (1 bedroom without a closet). The addition features a large rec room with access to the sheltered deck overlooking the backyard, and a spacious mudroom leading to the new basement. - The basement includes a large family room, bedroom, 3 piece bathroom, and utility room. - Recent updates to the house including kitchen cabinets and renovated bathrooms, air conditioner (2015), shingles (2018), water heater (2016), and many new windows (within past 10 years). -	28 x 32 Hip Roof Barn with 10 ft walls, moved to the yard in 1996, currently on blocks. -	The acreage is on Town of Wilkie water, septic is a septic tank with a pump-out north of the house. -	Currently used as a livestock operation, this property falls under the Town of Wilkie animal control bylaw. Under this bylaw there are some limitations to the number of animal units allowed, however is suitable for a small livestock operation, hobby farm, or equine facility. -	The corrals include 2 watering bowls and 5 pens, leading to the large perimeter fenced pasture west of the yard and a smaller pasture north of the yard. An outdoor riding arena is located south of the house.